A lot of what is on Democracy Now is good, but it's not enough to say that war is bad --it is much more important to say how people get tricked into supporting war, assuming that one wants an end to war. 90% of Democracy Now is good, but the 10% they avoid is the most important part. Ford Foundation funds Democracy Now! for the purpose of "incorporating the aftermath of the September 11th attacks into future broadcasts." 2004 Ford Foundation grant of $150,000 to Democracy Now. Why does the Ford Foundation - a pillar of the establishment invested in many of the corporations that Democracy Now claims to oppose - fund Democracy Now? In November, 2002, Amy Goodman spoke at a peace conference at the University of Oregon. After her speech, I asked her after the event if she would help investigate the recently disclosed story of how the CIA and National Reconnaissance Office were conducting a "plane into building" drill at the same time as the 9/11 "attacks." She would not reply, and looked at me in apparent fear. It was a particularly strange response considering she had just spoken eloquently about her tremendous courage in reporting on the massacre in East Timor. The issue of the 9/11 war games on 9/11 has not ever been mentioned on Democracy Now -- and it is likely that if they were, DN would run the risk of losing their foundation funding, which would force them to lay off much of their staff. Amy Goodman's passport saved her life in East Timor -- the Indonesian military death squads who massacred hundreds of civilians decided that it would be too much trouble if they killed two American journalists (she was travelling with Allen Nairn, who was beaten but not killed). But an American passport could not save any of the civilians caught in the inferno at the World Trade Center nor protect any of the people unfortunate enough to be on the doomed planes. This makes 9/11 a scarier issue than solidarity with oppressed "Third World" people from a relatively comfortable white, middle class, north American vantage point. An article about an incredible event at Riverside Church in New York City on September 11, 2003. Amy Goodman reportedly attended (in the audience), was recognized from the stage (and received tremendous applause) but did not speak there. .... McGovern has been generous with his political capital on more recent occasions; he spoke at the 9/11/03 second anniversary events in New York, and though he concentrated his fire on the Neocons' Iraq fiasco, the event at which he spoke (the panel, the agenda, the literature in the lobby, the subjects of the other talks, even the date of the event) was entirely focused on 9/11. Even if Mr. McGovern had adjusted his tie and quietly recited the alphabet, there would still be heavy symbolism in the sight of an ex-CIA analyst seated on a dias with Mike Ruppert, John Judge, Kyle Hence, and Cynthia McKinney. The sight of McGovern on the stage was more significant than anything he was at liberty to say. When Amy Goodman was in Eugene, Oregon on May 8, 2004, I asked her why she thought the liberal alternative media has ignored and censored evidence of Bush's complicity in 9/11. She replied that she had no opinion and asked me for my opinion. I replied that I thought it was a combination of fear and foundation funding controlling certain publications (ie. The Nation). She didn't have a direct response to this, but she said that she was reading David Ray Griffin's book The New Pearl Harbor and promised activists in Seattle that she (finally) would invite him on her show. I informed her that Michael Ruppert's book will be published soon, and her response was "good." Unfortunately, her May 27 interview of Griffin was not-so-good -- perhaps one could use the Newspeak term (from the novel "1984") "double plus ungood" to describe her show's hatchet job masquerading as an interview. May 2004 - Ellen Mariani, David Ray Griffin and Chip Berlet invited onto Democracy Now! Until May 2004, Democracy Now did not have any guests who dissented from the official story that 9/11 was the result of "incompetence" by the Bush regime, and studiously avoided any discussion of the most basic evidence of official foreknowledge and complicity. This track record was changed with DN's interviews of 9/11 widow Ellen Mariani (who turned down a million dollar hush money payment from the federal government in order to file a RICO lawsuit against the Bush regime) and David Ray Griffin, the author of "The New Pearl Harbor." Mariani's activism was described by the show's website as a concern about the "intelligence failure" of the Bush regime. While the full truth of 9/11 will probably never be known, it is already proven beyond reasonable doubt that the kindest interpretation is that the Bush regime knew about 9/11 in advance and deliberately let it happen, just like President Roosevelt knew the Japanese were about to attack Pearl Harbor and chose to allow those attacks to occur in order to galvanize a divided nation to support world war. (FDR did not need to give technical assistance to the Japanese to make sure the attacks succeeded - they were able to find Pearl Harbor on their own. However, the top military echelons kept the Army and Navy commanders in Hawaii "out of the loop" of the intercepted / decrypted Japanese communications that revealed that the "surprise attack" was about to take place, thus ensuring that the "Day of Infamy" would be allowed to take place unhindered.) The only "intelligence failure" of 9/11 was among the American public and media that refuses to connect the dots of the evidence of complicity. DN's May 26 interview of David Ray Griffin was more disturbing than mischaracterizing Ellen Mariani's quest for truth and justice. Griffin appeared on the show after a several months long campaign by the National 9/11 Visibility Project (www.911visibility.org) called "Waking Amy," an internet based effort to encourage DN to put Griffin on their show. When DN finally scheduled Griffin, he was going to be on the show along with Mariani - which would have been a very powerful interview. However, at the last minute, DN separated the two, and put Griffin on the air a few days later. Berlet is not an expert on the evidence of 9/11, yet was invited onto DN to appear with Griffin (instead of 9/11 widow Ellen Mariani). Berlet's previous comments on the evidence of official complicity have been primarily ideological objections, his writings show no familiarity with even the most basic evidence that debunks the official "surprise attack" paradigm and the "incompetence" explanation. Griffin started his presentation with the numerous prior warnings of 9/11, the insider trading on United and American in the days before the "attacks," the obstructions of investigations within the FBI, the failure of the Air Force to scramble interceptors in a timely manner, the involvement of Pakistan in funding the alleged hijackers, among other anomalies. Berlet ignored nearly everything in Griffin's book and opening statements, and focused instead the flase "no plane hit the Pentagon" hoax (evidence that the hoax was intended to give defenders of the official story a straw man option to ignore the real evidence). Amy Goodman's mistreatment of David Ray Griffin was also criticized in an article posted to various internet discussion sites by five members on the fringe of the 9/11 movement. This article, titled Amy Goodman and the CIA, was a mix of excellent analysis and unsubstantiated ranting. These five include some of the least careful "researchers" on the outskirts of the 9/11 movement, including the notorious "webfairy," who promotes absurdity that there weren't any planes used to attack the World Trade Center. 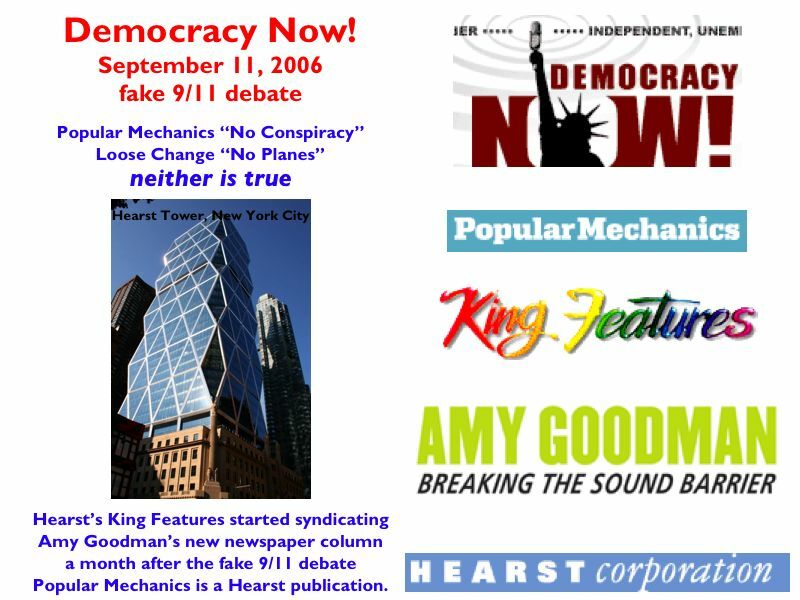 A fringe article from people promoting obvious hoaxes about 9/11 complicity accusing Amy Goodman of working for the CIA was effective in ensuring that Democracy Now! would not be interested in any follow-up coverage of these issues. In December 2006, the Muslim-Jewish-Christian Alliance for 9/11 Truth - a group promoting most of the worst 9/11 hoaxes - published a death threat against Amy Goodman on the MUJCA website. This outrageous hate speech ensures that Democracy Now! will never, ever cover the best evidence that 9/11 was allowed and assisted by the administration. If it's not an example of COINTELPRO then it is merely insane. When we launched our Democracy Now campaign, we asked activists and the general public to send them emails requesting they have David Ray Griffin on their show. We provided a sample letter, but encouraged people to write their own, and we asked them always to be polite. We also provided them the email addresses to send their letters, and we included our own email address in the mix, so we could see what kinds of letters Democracy Now was receiving. What happened was very telling. For every two or three emails they received that were respectful and well-written, they received one that was either highly insulting, vehemently anti-semitic, or down-right ludicrous. The timing and repetitive use of specific phrases among many of these emails revealed a coordinated effort to disrupt our campaign and convince Democracy Now not to associate with us. In October 2004, at the Bioneers conference in San Rafael, California, Goodman's assistant promised that they would consider interviewing Michael Ruppert about his book "Crossing the Rubicon" and his accusations about the role of the war games on 9/11 in ensuring the success of the attacks. To date, there has been no followup, nor is there likely to be. Even the fundamental reality of Peak Oil as a motivation for the invasion of Iraq has received virtually no coverage on Democracy Now! and related liberal / left media institutions. In August 2005, at the Real Goods solar energy festival in Hopland, California, Goodman admitted to this writer that she was unaware of the Complete 9/11 Timeline compiled by the Center for Cooperative Research (the basis for Paul Thompson's excellent book "The Terror Timeline"). She also declined to answer a question when DN! will discuss the role of Peak Oil as the reason for the Iraq war. "Nobody explained the circumstances under which he left," says As'ad AbuKhalil, author of The Battle for Saudi Arabia: Royalty, Fundamentalism, and Global Power. "We know for sure that he was tasked by the United States government back in the late 1970s and on to assemble the kind of Arab Muslim fanatical volunteers to help the United States and the C.I.A. in the fight against the Soviet communist regime [in Afghanistan]. In the course of doing that, this man is single-handedly most responsible for the kind of menace that these fanatical groups now pose to world peace and security." Yet, there al-Faisal sat on Tuesday as President Bush spoke of his war on terror and Cindy Sheehan was being booked. At one point, the cameras even panned directly on al-Faisal listening intently to Bush. Jeremy Scahill, a correspondent for the national radio/TV program Democracy Now!, is a Puffin Writing Fellow at The Nation Institute. He can be reached at jeremy(at)democracynow.org. The answer is obvious -- Bush wanted the attacks, Bush needed the attacks, Bush (and his henchmen) interfered with efforts to stop the attacks, Bush's henchmen provided the attack with technological assistance (war games to confuse the air defenses? ), and afterwards spread lots of disinformation in favor of the official story (the false claim it was a surprise attack) and disinformation to exaggerate their involvement (the no plane hit the Pentagon hoax is the most popular). With the price of oil soaring to record highs and oil companies reporting record profits, many are asking whether the world has reached peak oil production. Peak oil occurs when half of all existing oil has been pulled from the ground. Some experts believe we are at peak now while others disagree. We host a debate on the issue with Julian Darley of the Post Carbon Institute and Michael Lynch of the Strategic Energy & Economic Research. The flat earth and round earth perspectives. I'm glad that Julian Darley was invited, but it's interesting you couldn't just profile the good work that the Post Carbon Institute is doing without inviting someone who claims it's bunk. I've said for years it would be a race to see whether the "progressives" would focus on Peak Oil as a core reason for current events (Iraq, 9/11, vote fraud, civil liberties) before gasoline rationing or much higher prices. And this was the reply from DN! re: The flat earth and round earth perspectives. In almost all subjects, opposing parties such as the DOD, state office, NYPD etc. are invited in to state their case. Most decline. I'd like to profile Julian's work but, in my opinion, if you are portraying yourself as unbiased news, your guests need to fairly match the perspective of society's or your going down the same road as Fox news. I think all intelligent listeners/viewers heard Julian clearly. There has been at least one other show in the last month that I remember where some discussion on peak oil was done. and it has certainly started it's way on mainstream news with CNN and more. In our community here in No California we are bringing people together weekly to plan for "the end of the suburbs". We plan to have Richard Heinberg up to speak in a month or so. If DN! invited a civil rights leader onto the show, they probably would not ask a member of the KKK to debate them -- that is the equivalent of asking an anti-environmentalist to debate whether Peak Oil is real or not when trying to profile the Post Carbon Institute. Popular Mechanics March 2005 article on "9/11 Lies" used a 9/11 "truth" website (www.questionsquestions.net) to debunk two of the straw men claims that some of the fringe 9/11 websites have promulgated to muddy the waters. Both of those fake claims are in the absurd Loose Change film. Since Democracy When has decided to have this fake debate (no plane versus no conspiracy, when neither is true), it seems obvious that DN is very aware that they have deliberately setup a bogus conversation that will further poison the conversation about these core issues. "King Features Syndicate, a print syndication company owned by The Hearst Corporation, distributes about 150 comic strips, newspaper columns, editorial cartoons, puzzles and games to nearly 5000 newspapers around the world. King Features Syndicate is a unit of Hearst Holdings, Inc., which combines the Hearst Corporation's cable network partnerships, television programming and distribution activities and syndication companies." February 2007 - another cointelpro style attack on DN! Life After The Oil Crash: the role of DN! A while back, a well-meaning LATOC reader emailed me to ask why I cracked a joke about Amy Goodman in which I derisively referred to her as a corporate Alpha-Female in disguise, or something along those lines. I attempted to explain what her true role in the petroleum-banking matrix is but I think this interview sums it up. Thomas Friedman is pro-globalization, pro-war, pro-corporate America, etc. In my opinion, Goodman's niche within the petroleum-banking matrix is to keep the 1%-5% of the population that considers themselves "dissidents" invested within what Jeffery Brown calls the "iron triangle" formed by the media, housing, and banking industries. Now don't get me wrong, I'd prefer 30 minutes of Amy Goodman over 30 minutes of Rush Limbaugh any day of the week but I'm not a fool. Limbaugh's niche is to keep a certain (perhaps) 25%-to-33% of the population who identify themselves as "conservative" squarely trapped within the iron triangle. The Al Frankens and Randi Rhodes of the world exist to keep the 25-to-33% of the population who identify themselves as "liberal" trapped within the iron triangle. Goodman exists to keep the 2.5-3.3% of the population who identify themselves as "radicals" or "dissidents" within the iron triangle. The only differences were superficial. The Goodman listener might have a hybrid with a Che Guevara bumper sticker where the the Limbaugh listener has an SUV with a "W" sticker but, in the end, their respective lifestyles were far more similar than different. They're just located in within different corners and/or opposite sides of the "iron triangle." I've never seen or heard anything on DN that would have helped the listener/viewer deal with numbers one-through-six listed above. The best I could tell, these things would vaguely be solved by getting some slightly greened-up Democrats into office. I have been a peace and justice activist for over 20 years, and I listen to Democracy Now every weekday. Your show is a mainstay for the movement. Thank you for informing and inspiring so many of us. A little about me: I was a homeless rights activist with Food Not Bombs in the SF Bay Area for many years. I was arrested with Michael Parenti and 279 others in SF during the 1996 torchlight march in support of Mumia Abu Jamal. I helped organize the 1998 conference, "Critical Resistance: Beyond the Prison Industrial Complex" in Berkeley. I have written for Z Magazine (you referenced one of my articles on your show concerning immigrant rights and the Sierra Club), and I participated in the WTO protests here in Seattle, as well as in many other civil disobedience actions. I was also a friend of Judi Bari’s. I mention this about myself in the hopes of establishing a basic level of openness and trust so you will take seriously what I have to say next. I am currently the co-director and webmaster for the 9/11 Visibility Project, an organization supporting the 9/11 families. As you are aware, we have launched a grassroots campaign requesting that you have author and theologian David Ray Griffin on your show to discuss his book, “The New Pearl Harbor,” which details evidence for US government complicity in 9/11. Exposing the 9/11 cover-up is the most important thing we can do to stop this Administration and their global agenda of war and empire, and many of us on the left who have been your most avid supporters are utterly bewildered that you have not done so. The non-corporate, independent media has a moral responsibility to at least ask the difficult questions -- for the sake of our fragile democracy, as well as the victims of US imperialism around the world. Even the National Green Party in a recent press release has come out in support of the 9/11 families and called for a new investigation into 9/11 that focuses on the evidence for US government complicity – like, for example, why NORAD violated standard operating procedures and did not launch jets to intercept the hijacked planes until it was too late. The 9/11 families have been screaming for an answer to this question for almost three years, and not once has Democracy Now addressed this issue. Why? And why has Ellen Mariani not yet appeared on Democracy Now? She’s the 9/11 widow from New Hampshire who is suing the Bush Administration under the RICO Act for allowing 9/11 to happen as a pretext for the war on terror. Her case has been recently nominated for the award of “most-censored news story” of the year. And there are many other people, like Howard Zinn (who has endorsed Dr. Griffin’s book) who you could have on your show to talk about this essential issue. Please, Amy, the consequences of remaining silent are too great (as history has taught us). These are pivotal times. Our country and the world are in great peril. We need you. The world needs you. Please expose the 9/11 cover-up and have Dr. Griffin on your show. note: Ellen Mariani did appear on the show soon after this letter was written, but Democracy Now called her lawsuit a complaint about the "intelligence failure" that led to 9/11. Her lawsuit actually accused the Bush administration of complicity in the event, not a "failure" of intelligence. Amy Goodman was in town last night. Outstanding. She affirmed with facts and statistics what most of us know--the US is truly in deep trouble. The co-opting of the media is in advanced stages. If we wonder how we will ever right (the good kind of right) our political system, it is apparent we must take back our media. I gave Amy Goodman THE NEW PEARL HARBOR and a 911truthnow button last night. I only had a minute while she signed the books I bought. As she handed me the signed copies, I handed her Griffin's book and the button and simply said, "Please consider interviewing this author. It's important." Weary from days on a book tour and having that night already signed a few hundred books, she nonetheless paused from her signing frenzy, looked at the book, looked hard at the button, and then looked at me, without saying anything. I'm sure it was only a second or two, but if felt like a long time. Then she said simply and gently, with an intent look into my eyes, "Thank you. I will." I hope she does seriously consider Griffin and that his words touch her heart and mind, because everything she said last evening, in a nearly two-hour presentation to several hundred people feeds the need for an independent investigation into 9/11--and for vigorous media scrutiny of the government's statements around it. If she believes what she says--and she most surely does--she needs to step back and heed her own words. The magnitude of things she has witnessed with her own eyes, of the experiences of her life's work, and the intelligence that she brings to inquiry, will hopefully allow her to overcome her own personal misgivings about venturing into this arena, whatever they may be. During her talk and the Indymedia video that preceded it, which exposed US involvement in atrocity after atrocity after atrocity throughout the world over the past 50 or more years, she nonetheless repeated the official story of 9/11 without introspection: "Muslim terrorists flew planes into buildings." What I heard from Amy was much like what I've heard from long-time activists that it was not surprising that terrorists would do this considering what the US has been doing all over the world for decades. Her entire case last evening was that the US government perpetuates unthinkable deception and destruction to advance the corporate agenda throughout the world, yet not one hint in her remarks that 9/11 was any other than the story from the self-same government and corporate media she so clearly understands. All of us, no matter how long we've been activists and how much we know of our nation's history--especially contemporary history--eventually come to a place in the road where we cannot go. For many of us, it is the killing of our own. Its heinous nature is such that we try to find every other explanation except the evident one. We've already had to suspend our belief systems to accept that our government would condone, actively encourage and actually commit crimes against humanity in foreign lands. But to suspend our beliefs even further to acknowledge our government is now using those well-honed tactics against its own people, is a difficult threshold to cross. I suspect that this is the reason the Progressive Left and what little media there is on the Left has so steadfastly avoided 9/11. The Left can report on East Timor, El Salvador, Iraq, Afghanistan, Venezuela, etc. etc. etc. and describe in great detail US involvement. Our current UN Ambassador Nicholas Negroponte's involvement in Honduras, for example, supplying the contras to over through the government in Nicaragua and now his appointment as the replacement for Bremer in Iraq in June, etc. These associations, this "institutional history," the malfeasance--the Left can expose this stuff and does, but those same skills, that memory of names and places and people from the past that needs to be applied to 9/11 has simply not been forthcoming. It has been left to hundreds of disparate amateur investigators to parse together the story, while those with the skills and tools and resources at their disposal to do this work have looked outward and not within. The story that Amy closed with helps, I think, to further explain how difficult 9/11 is for everyone--not only here but throughout the world, especially as it relates to the actions of our own government. It is our Jekyll and Hyde personality that she described so eloquently in retelling her experience in East Timor when, as journalists, she and her cameraperson were beaten by the military and nearly killed. It was at the hospital later that she saw so clearly the dichotomy as they, blood-sodden Americans, presented themselves for treatment. The hospital staff, despite having attended hundreds of casualties that day, wept at the sight of the two Americans. They cried because, although our country is known throughout the world as being in consort with ruthless killers, we also are often viewed as the last hope for salvation. We are at once the Sword and the Shield. The people of East Timor wept--despite 95% of the weapons being used against them having come from the US--because if the American journalists were killed, they had lost their hope that anyone on the outside would ever hear their story and know of this massacre they were experiencing. They had lost their Shield. ... livid with frustration that Democracy Now! has thus far never explored the possibility of intentional complicity within the US government in the September 11th attacks. He said that Amy has stopped taking questions at the end of her addresses specifically to avoid answering uncomfortable questions about 9-11. He was really frustrated that the alternative media won’t touch 9-11 complicity, and avoid it so assiduously that when stories about it become public, they break in the mainstream media instead.